Last night, S and I hosted some friends for dinner. It was a special occasion as one of S’s childhood friends, F, was back in town on her first visit home in 3 years. And she had come home with her boyfriend, an extremely charming Brit named Matt that we certainly hope to see more of over the years. Joining us was F’s little sister and three other friends—one couple and a bachelor buddy. The couple is getting married in November and had brought along some wines, which they’re thinking of serving at the wedding dinner, for us to taste. As usual, S and I split the cooking duties. Since it was a working day, S allowed me to make the easier courses. We started with a simple dish of San Daniele prosciutto and melon. This was followed by baked butterfish medallions served with angelhair pasta (that had been tossed in an aglia olio spiked with laksa leaves) and a laksa sauce. 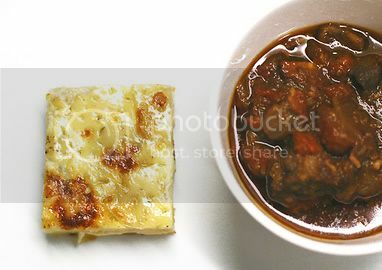 For our main course, we had a wonderful Italian gulyas (goulash) served with a Gratin Dauphinois. To end the meal, we gave everyone a small bowl of Melissa’s chocolate gelato and an amazing ice cream sandwich that S had made using brownie-cookies and mint chocolate chip ice cream (which I will post about later this weekend). It was S’s first time making goulash, a dish I completely adore. When I was in university, I spent a semester studying in a small town on the Austro-Hungarian border, which meant I had the complete pleasure of consuming bowl after bowl of goulash all over Austria, Hungary and a number of other Eastern European countries. S, however, had never had an authentic goulash. Thankfully, the recipe she tried was fantastic and I can happily say it was one of the best I have ever had. I must add that S and I discussed at length whether to use the picture (above) that I shot of the goulash and the Gratin. Both of us prefer “pretty” food shots, the kinds of images you find in Donna Hay’s magazine (and now every other Aussie food magazine), i.e. highly stylized and sensuous. The above, we felt, was more “real”, perhaps too real. It reminded us of the sort of gritty realist style that a lot of British cookbooks seem to favor. I’m still not sure if I like this picture, but it was, in the mad frenzy of plating the dishes and serving them to our friends, the best of the few I shot. Rub the meat with the paprika, 2 tbs salt and the olive oil. Cover and marinate overnight in the refrigerator. Preheat oven to 130 degrees Celsius. Bring the beef to room temperature before placing a large sauté pan over medium heat and cover the base of the pan with a little of the ½ cup of olive oil. Add the pancetta/bacon and let it render its fat (about 7 minutes). Transfer pancetta/bacon to a plate. Raise the heat to high and brown beef cubes, adding olive oil as needed. As each batch is ready, transfer to a Dutch oven. Reduce the heat to medium, add the onions and sauté, add more oil as needed, until softened. Stir in paprika, cayenne, cumin and garlic and cook for 5 minutes to blend the flavours. Add the seasoned onions to the beef along with the pancetta, wine, tomatoes and their juice, herb sachet, and lemon zest. Place over medium heat and stir to combine. Bring to a gentle boil and place a cartouche over the surface of the stew. Cover with lid and insert into pre-heated oven for 3 hours. Discard herb sachet. Season stew to taste. Tastes best refrigerated overnight, then reheated. I love goulash too. I like the photo, and it shows your skill being able to make a bowl of brown meant look so tasty! Stylised photos are all the rage these days, I know, but what with all the soft focus emphasis, sometimes you can barely see the food. I think this photo is great. Simple but balanced and sometimes that’s just what you’re in need of. Clare: Thanks. What recipes do you prefer? Augustus: I guess you’re right. Simple is sometimes better. And I agree, the trend towards overly pretty food shots can sometimes get out of hand–to the point where you can’t see the food properly. I always ask, is it about the food or the photo. And when it comes down to it, for me, its about the food. I think your image converys the heartiness of the meal – and goulash is indeed hearty! Ah! Casserole. Casserole, I know. Hi Chubby Hubby – this is my first comment after lurking around on your website quietly. Your blog is really good, and I like the humorous writing..
Just couldn’t resist that gulyas picture – very inviting. This is probably one of the best dishes one can eat on those cold and dark winter nights up North.. Will definitely give your version a try in a couple of months!! The funny thing is, I had always eaten meaty goulash at Hungarian restaurants and always had the impression that goulash is a heavy meaty dish. Much to my surprise then, when I was in Budapest and then driving out in the countryside to the Tokaj regions that all the gulyas I ate from town to village was a thin watery stew that required the addition of bread for sufficient sustenance. I wonder if meaty goulash is yet another example of what happens when regional food gets expatriated – such as Chinese food that travelled to America and returned as Moo Goo Gai Pan, completely unrecognizable to the Chinese, or American-Italian red sauce meals that might(?) be alien in Italy. Perhaps the “alla triestina” might be a clue here – the Slavs east of Trieste love greasy meat and might be responsible for the alterations.